Our 6-carriage DEMU rushes over the crest approaching Frant, on its way to Kidderminster and Bridgnorth with our Severn Explorer railtour of 24 April 2010. Photo by Don Benn. The ‘Hastings’ Diesel-Electric Multiple Units (DEMUs) are a unique type of narrow-bodied train which was constructed in 1957 and 1958 for the London–Hastings service via Tunbridge Wells. After the route was electrified in 1986 most of the fleet was scrapped, but some of the carriages were bought by a specially-formed company called Hastings Diesels Limited. Following restoration at St. Leonards depot, the train pictured above is available for use and has run extensively in public service on the main line. 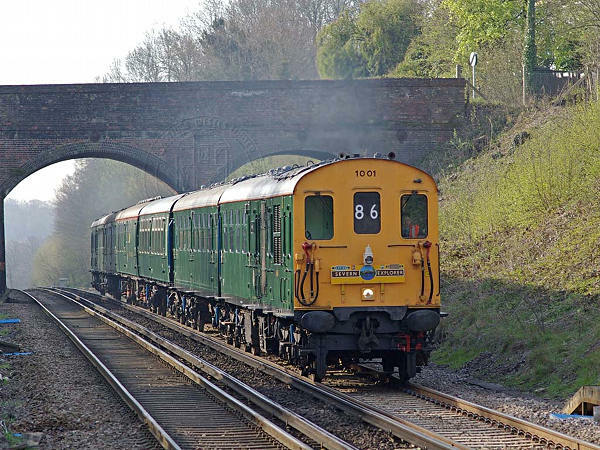 © Copyright 2000–2019 Hastings Diesels Limited and contributors.